Video: Supra Society x Deion Sanders - "Prime Time"
Supra designs a custom version of the Society to celebrate Deion Sanders' induction into the Pro Football Hall of Fame. Sure, Deion Sanders was one of the mouthiest athletes to ever play professional sports. However, it was difficult to really criticize Deion, because he was every bit as good as he said he was. He'd be the first to tell you that his boisterous personality was really just the product of confidence, rather than arrogance. One of the best, if not the absolute best shutdown corners in NFL history, Sanders was officially voted into the Pro Football Hall of Fame on February 5th. The former Atlanta Falcon, San Francisco 49er, Dallas Cowboy, Washington Redskin and Baltimore Raven finished his career with 53 interceptions, returning 9 of them for defensive touchdowns. 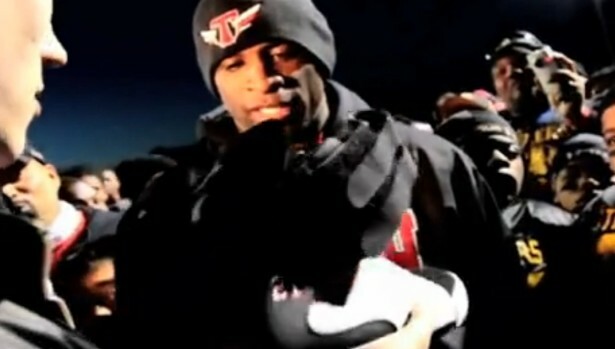 Deion is also an icon in the world of sneakers and fashion, so it only makes sense that he's honored in our world too. Supra Footwear has chosen to salute the two-sport legend with a custom designed Society high-top. The "Prime Time" Society features a mixture of patent leather, nubuck and SupraTuf on the upper. The black, red and white colorway is inspired by the Atlanta Falcons, who drafted Deion in the first round of the 1985 NFL Draft. Embroidered on the back of the shoe is Deion's "Prime Time" nickname, as well as his famous jersey number 21. Making the shoe extra special, the footbed of each shoe displays a black and white photo collage of Deion's 14-year career. Supra produced just 21 pairs of this hand-crafted custom Society for Deion, family and friends. We're unsure of whether or not this will lead to something bigger, but we'll keep you posted if we hear something. 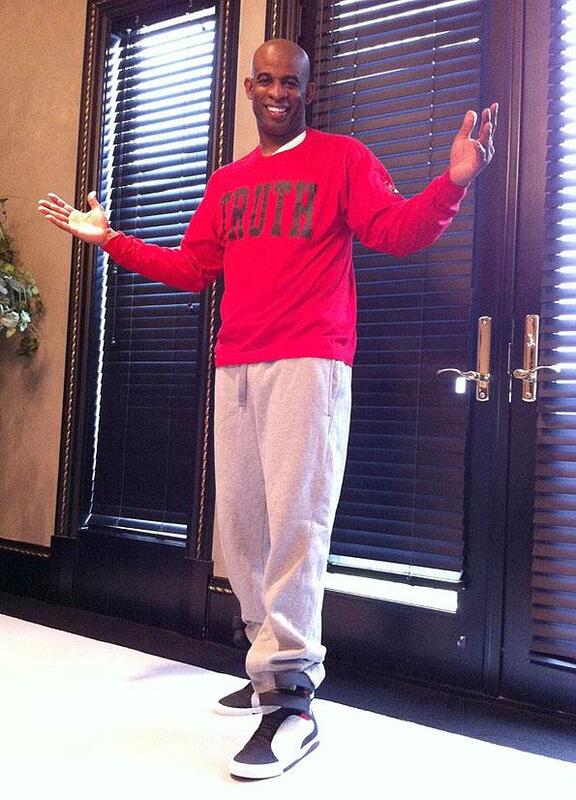 In the meantime, check out the video of Deion receiving his custom Society and a photo of him wearing them at home below.